I began training in 1969 at the age of 15 with the late James Pruitt, RPT, of Decatur, Ga. Mr. Pruitt was very skilled in tuning, rebuilding, and refinishing and was a wonderful introduction to fine and honest work. At age 16 I continued training with William Maxim, RPT in Columbia. Bill is an excellent tuner/technician and very close friend. He has continued to help me throughout my career. Without Bill I wouldn’t have the career I’m enjoying. Later I was fortunate to work for Chris Finger, RPT and Hank Lea in Boulder, Colorado. With Chris’ guidance my understanding and vision of what top quality work could be was instilled. At that time I started attending Piano Technicians Guild chapter meetings. The PTG promotes education and training and sets high standards. 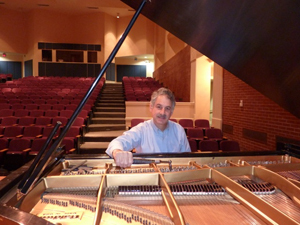 In 1988 I passed the PTG exams and earned the Registered Piano Technician rating. 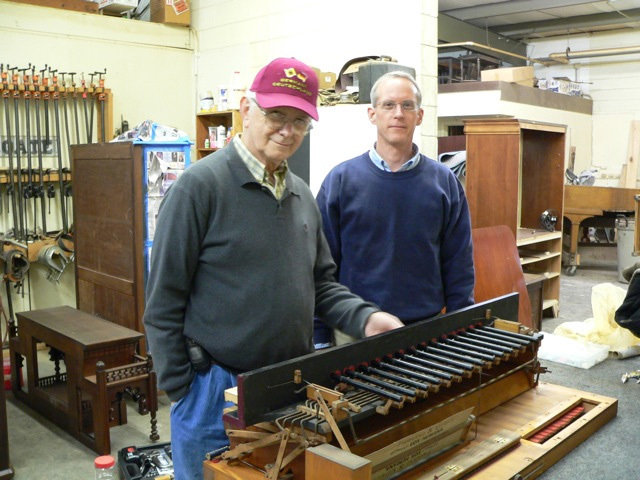 Later I worked for 5 years rebuilding grand pianos for Rice Music House, who is the Steinway dealer in Columbia. There I worked for A.J. Connor who was a fine troubleshooter and taught me much. He generously helped many technicians and was a great friend to many piano teachers and their students. In 2002 I was fortunate to attend Yamaha’s Little Red Schoolhouse for training in grand piano regulation and voicing as well as training in the Disklavier player system. This Fall I will train at Steinway in NY on their new Spirio player system. I am currently the president of our local PTG chapter. The PTG has national and regional conventions offering a wide variety of classes. My mentor William Maxim, RPT with my apprentice journeyman Jeff Maddox, Assoc. PTG.